Here are some of the clever ways we've discovered to implement lighting in your home decor. There are three different types of interior light that each serve a specific purpose. General lighting comes from overhead fixtures or pendant lights. Specific (or task) lighting, such as table lamps or desk lamps, is focused on a particular area. Ambient lighting, provided by items like candles and sconces, is the most decorative type. Use a mix of all three to give your home its unique personality. Mirrors are traditionally used to make a space appear larger, which happens because they reflect light. Hanging mirrors on the wall, especially a wall opposite a window, is a great way to take advantage of natural light. Basic white lampshades allow the most light to pass through, but they tend to set a cold tone. 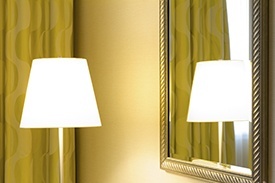 Colored lampshades give you more control over the effect to make it warmer, cooler or richer. If the room you're lighting is large or has high ceilings, add balance with several small lights that will make the room feel cozier. Lamps are not just for tables. Make a style statement with an overhead or sculptural floor lamp. String lights can be used as an everyday accent or they can provide a decorative touch for holidays or entertaining. They also work well on balconies and patios. Up lights, clip lights and clamp lights offer remarkable versatility. They throw highlights on a particular area or object, and their portability accommodates any decor changes. Share your imaginative lighting ideas with us in the comments!